Why Invest in Professional Writing Services? I’m here to make you happy. You like being happy, right? 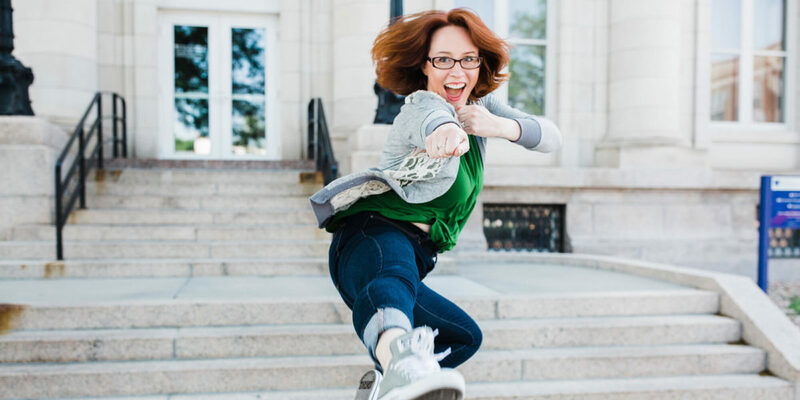 I’m a Nebraska freelance copywriter here to save my clients time and brainspace by providing written content for their small businesses. What does that mean, exactly? I’m talking about blog posts, website copy, marketing materials, you name it — customized specifically for a business and written directly for its target audience. What makes me so qualified, huh? I’ve been working in the copywriting industry since 2010, writing for businesses large, small, local, and national. I’ve written blog posts for awesome publications like Flywheel’s the Layout, corporate website copy for Diamond Vogel, and built loyal relationships with innovative, dependable website designers all across the country. With a little help from my degree in English and Theatre, I am able to represent a business the same way I would represent a character on the stage: through research, discovery, and the ability to portray a brand with authenticity and accuracy. Clients who work with me enjoy more free time to focus on what they love, and the peace of mind that comes with letting a professional take the wheel. Let’s raise the curtain on your brand. Like I said before: I’m here to make you happy. I’m here to take on the copywriting work that you don’t have time, don’t know how, or simply don’t want to do. It’s time to sharpen your business’ message, buff it up all nice and shiny-like, and send it out into that spotlight. I’ve got a handy contact form just for you. We can grab coffee, or chat on the phone, or use futuristic screen-talking technology. Whatever works. Copyright © 2019 The Curtain and Pen • All Rights Reserved • Website by LP Creative Co.